When we bought our home, we knew we'd be buying something in our price range that would need a little loving, not because it was abused but it would just need updating. We were blessed beyond our imagination when our wonderful friend and realtor found us a big house that just needs some updating. I wasn't wild about the tile floors but they're much better than carpet and nothing a rug can't spruce up. The house had the most important thing for us, SPACE, at near double the size of the house we were currently renting. And the neighborhood has turned out to be wonderful, with quiet and friendly neighbors and plenty of roads to run on (or for the kiddo to ride his scooter). Now we have been in our house for just over a year and regretfully, we haven't don't a thing! It's not that I don't want to update it, but until I can tackle major renovations (like the kitchen, she has mauve laminate counter tops, it has to be the most expensive thing that needs changing) I am hesitant to do the small things for fear that I might have to scrap them or change them later. The house, being built in 1991, has some wonderful wallpaper about. Someday I'll show you my wonderful blue/green/pink stripes in the bathroom. I have this bad habit, in the diningroom, of routinely pulling off wallpaper because it's already peeling on its own. It gives the diningroom a chic, derelict appearance, great for entertaining! While routinely peeling a piece off, I discovered something. I think most people, when buying a home, hope to find something special within their home. Maybe a box of gold, cash stuffed in the wall or something built in that just speaks to them. 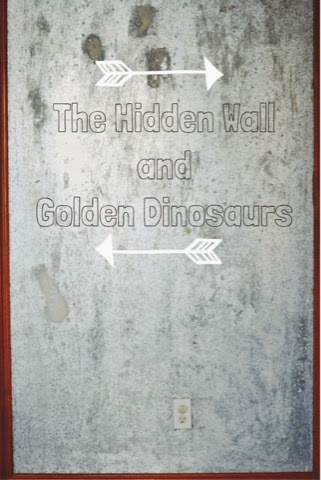 I didn't find gold or cash, instead I had a wierd wall. Framed in and wallpapered by the back door with no idea why they did that. My friends have all studied it during dinner, trying to discover its secret use. Maybe it used to be a door? A secret passage? Maybe it's just a strange thing they did in the 90's? Of course, it became the victim of my tendency to pick at the wall one day and upon peeling the wallpaper back I screamed. Just about gave my husband a heart attack but it was all excitement. I discovered, under that wallpaper... sheet metal. Why is the exciting? IT'S A MAGNET WALL! Not even kidding. I ran straight to the refrigerator and stole a few magnets to show off my discovery! This is the kind of thing in a home that is ME, who knew it was there. I texted it to my friend (our realtor) and showed her the discovery, she thought it was pretty odd too. But it's a wonderful thing, for me, the unique and quirky thing that sets my home apart. It fits my style, I love things that are modern and minimal but also love farm house charm. I actually have not cleaned the wall yet but I think the old glue gives it a worn in feel. I'm slowly working up hanging pictures, building a collection of artwork and photos. I finally have a place for Polaroids... If I ever get my hands on an instant film camera (Fuji film going on my Christmas list!). For now, I got on amazon and ordered supplies for something that would be me and my son loves them too. 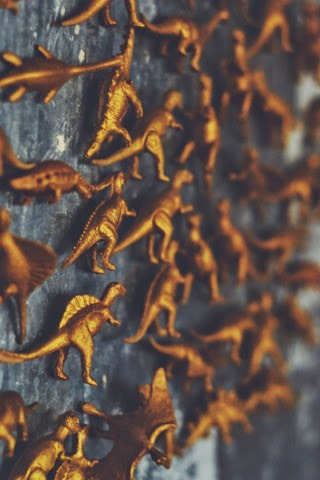 Gold dinosaurs. Okay, so the kiddo could careless if they were gold, but it's the perfect magnet for my personality and I don't worry about him playing with them. Every once in awhile a Dino makes the trek to another room and has to return home, but with kids you just can't be too attached to anything. 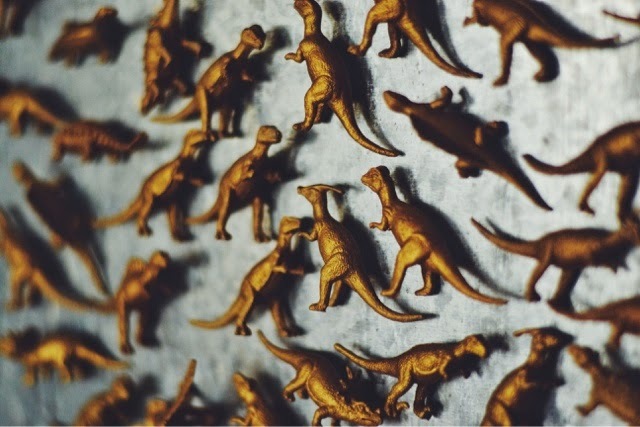 Obviously I did not buy them gold, I bought regular mini plastic dinosaurs, painted them and glued the magnets on. I used Martha Stewarts gold paint, spray paint would have been easier but I knew my son would want to help. A few hours on and off coating these guys was a great activity for a day, keeping little hands busy. 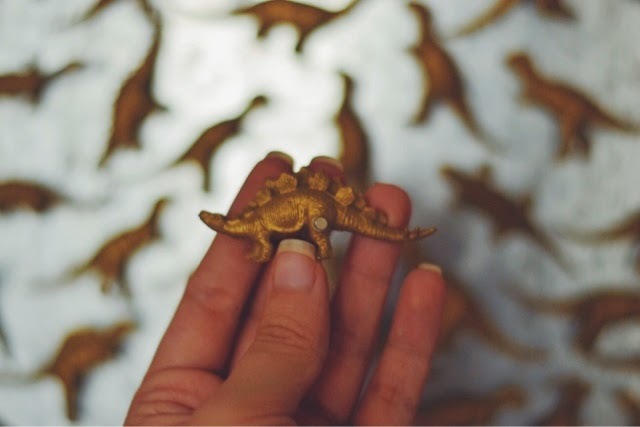 Plus, someday I'll make some magnets to identify each dinosaur and it will become a learning tool. Yes, my kid will know all the names! I used these tiny but powerful magnets I found on amazon, a few have popped off after being super glued on, but I after I glue them a second time, they have stayed put. Only about five out of the fifty have popped off so far, not a big deal to me. 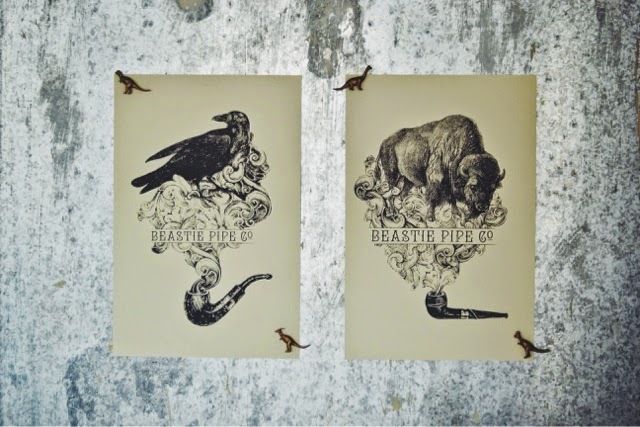 I'm pretty excited about my wall, building up the artwork on it and using it for displays. 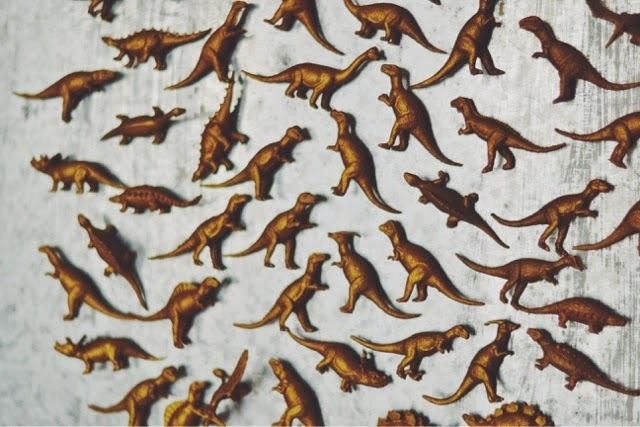 I am a big believer it doing what makes you happy, I already get odd looks when I talk about a magnet wall and gold dinosaurs, mostly because of my dinosaurs. 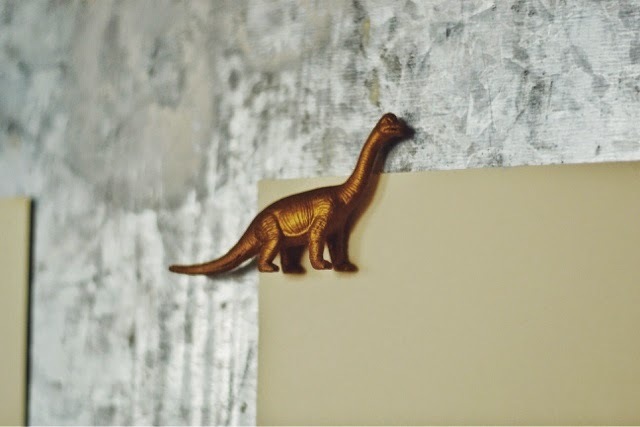 Why decorate with dinos? Because I love them and I can, so why not? I'm thinking of adding in some gold alphabet letters next. Bonus information, I was talking to my neighbor about my discovery and she knew it was there! 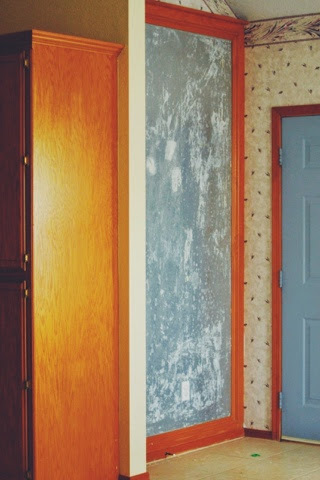 But she said it wasn't wallpapered when the house was built, the guy that owned the house previous to us must have done that. She said the builder that built all the original homes in our neighborhood used to do that as his signature thing, so several of the houses in my neighborhood have those walls, but most people have covered them like mine was. I'm leaving mine uncovered because I am in love with it.